Signs of an improving U.S. economy and that the worst has passed for Europe is allowing the most economically sensitive stocks to benefit in a major way. NEW YORK (TheStreet) -- Signs of an improving U.S. economy and that the worst has passed for Europe are allowing the most economically sensitive stocks to spread their wings again. The Morgan Stanley Cyclical Index -- made up of companies whose fortunes are deeply tied to the state of the economy -- has soared 11% this year, led by companies such as Alcoa ( AA and Sears Holdings ( SHLD. 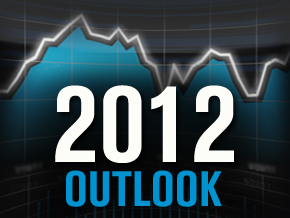 Furthermore, the S&P 500 has risen 4% so far this year after closing almost unchanged in 2011. All this, as corporate prospects begin to improve in the eyes of the investor, and companies show the results of the critical reforms they implemented while waiting out a period of tepid operating conditions. As 2012 unfolds, many of the stocks most sensitive to economic changes are already beginning to take off again, shrugging off the more negative headlines on the economy and moving forward on constructive plans for growth. Here are six economically sensitive stocks from the Morgan Stanley Cyclical Index that are showing the most gains so far in 2012. Company Profile: Alcoa is an aluminum, alumina and fabricated aluminum products producer. Operating in 31 countries, Alcoa's products are used around the world in aircraft, automobile, commercial transportation, packaging, building and construction, oil and gas, defense and industrial applications. TheStreet Ratings Grade: Hold. TheStreet Ratings team is concerned that even though Alcoa's fourth-quarter sales increased, net income decreased, and the company now has weak liquidity. Standard & Poor's View: Leo Larkin, analyst, Standard & Poor's, calls Alcoa a "special situation turnaround" and an investment vehicle through which investors could really benefit from any surge in aluminum demand. Larkin is seeing great profitability and less volatile earnings throughout the course of the business cycle as Alcoa lowers its breakeven point through cost-cutting and a ramp-up in production at new, lower-cost plants. The company, says Larkin, continues to reduce its debt and now is placing greater emphasis on boosting free cash flow in order to fund growth projects. Alcoa is attractively valued compared to industry peers, Larkin adds. Company Profile: Sears is the parent company of Kmart and Sears. The company operates about 2,201 full-line and 1,354 specialty retail stores in the U.S. through Kmart and Sears, and about 483 full-line and specialty retail stores in Canada through its subsidiary Sears Canada. TheStreet Ratings Grade: Sell. Sales and net income have dropped at the company; but growth has outpaced the average competitor within the industry, TheStreet Ratings analysts note. Standard & Poor's View: Analyst Jason Asaeda is feeling much more positive about Sears' ability to win new customers under the stewardship of the company's new Lou D'Ambrosio. Asaeda expects store-level improvements to gain traction in fiscal 2013 as the company closes 100 to 120 underperforming Kmart and Sears Domestic full-line stores and increases investments on its more productive stores. Asaeda is also expecting "sharper pricing and more impactful marketing" under D'Ambrosio's leadership. Company Profile: Magna International is a diversified global auto supplier that designs, develops and manufactures high-tech auto systems, assemblies, modules and components, and engineers and assembles vehicles, mainly for sale to cars and light truck original equipment manufacturers. TheStreet Ratings Grade: Buy. Magna's third-quarter gross profit margin decreased from the same period last year, but sales increased. The company now has a quick ratio of 1.06, says TheStreet Ratings team, which shows that this company has the ability to cover short-term cash needs. Standard & Poor's View: Although auto analyst Efraim Levy points to the potential that Magna could be hurt by currency fluctuations and slower-than-expected demand for vehicles in general, and vehicles with high Magna content, "we believe Magna's valuation should be higher than most peers." Levy's view is driven by Magna's strengthening balance sheet, strong manufacturing capabilities and the company's implementation of several shareholder-friendly actions, such as a 2-for-1 stock split, a share buyback program and increased cash dividend payout. Magna also recently eliminated a dual-class structure that gave the former chairman, Frank Stronach, and three of his family members greater voting rights than other shareholders. Company Profile: Masco makes, distributes and installs home improvement and building products, including faucets, cabinets, coatings, windows and insulation for the new home construction market, mainly in North America. TheStreet Ratings Grade: Sell. TheStreet Ratings team says that key measurements including liquidity indicate that it's relatively unlikely that Masco will face financial difficulties in the near future. However, the company's liquidity has decreased from the same period last year, indicating deteriorating cash flow. Goldman Sach's View: Joshua Pollard, analyst has now changed his view of Masco shares to neutral from sell, because he believes the company is beginning to fix its cost structure. In addition, full-year 2012 earnings consensus estimates for the company have fallen 65% since October 2010, which means that they will now be much more achievable by Masco -- lowering the risk of disappointment. Although the company may still face the risk of price competition in cabinets, long-term investors should feel encouraged by the company's recent management changes and streamlining of its installation capacity, says Pollard. Company Profile: Freeport-McMoRan is a copper, gold and molybdenum miner with assets around the world. Its portfolio includes the Grasberg minerals district in Indonesia, mining operations in North and South America and the Tenke Fungurume (Tenke) minerals district in the Democratic Republic of Congo. TheStreet Ratings Grade: Buy. Freeport-McMoRan is "extremely" liquid, says TheStreet Ratings team. Its quick ratio of 2.07 shows that the miner can cover any short-term cash needs. Goldman Sach's View: Freeport-McMoRan on Thursday provided sales volume guidance that wasn't quite as robust as Goldman had hoped; but analyst Sal Tharani remains optimistic about the miner's prospects. "We believe that the company is being conservative as usual and that guidance will increase throughout the year," said Tharani. Freeport on Jan. 19 lowered its 2012 sales guidance for copper to 3.8 billion pounds from 3.9 billion. However, it raised its projections for gold to 1.2 million ounces and left them unchanged for molybdenum. Fourth-quarter earnings came in at 67 cents a share, beating both Goldman Sach's estimate of 65 cents and the consensus estimate of 60 cents, mainly thanks to good sales volume. Company Profile: Whirlpool manufactures and markets a wide range of home product appliances in 12 countries under 13 brand names. The company's products include laundry appliances, refrigerators, cooking appliances, dishwashers, mixers and other small household appliances. TheStreet Ratings Grade: Hold. While Whirlpool's gross profit margin for the third quarter of its fiscal year 2011 decreased compared with the same period a year ago, the company managed to grow both sales and net income at a faster pace than the average competitor in its industry that quarter, compared with the same quarter a year ago, says TheStreet Ratings team. Standard & Poor's View: Equity analyst Jim Yin cites ongoing global economic growth problems as his primary concern for Whirlpool's future performance. In addition to Whirlpool's exposure to Europe and the U.S., Yin is also worried about impact rising material costs will have on the company's operating margins. Still, on a more positive note, Yin thinks such headwinds would be partially offset by continued strength in Asia. Although competition is increasing in Latin America, "we see strong demand for appliances in Asia and Latin America," he says. >>To see these stocks in action, visit the 6 Stocks Driving the Economy in 2012 portfolio on Stockpickr.